Domestic natural gas output, especially from the KG D6 field, has been in consistent decline from 2011-2012 (April-March) till 2016-2017. And imported LNG has been uneconomical owing to its high price. As a consequence, India’s combined-cycle gas turbine power plants (CCGTs) have been struggling to survive. They face a bleak future unless the government comes to the rescue by offering financial support and tweaking certain policy initiatives. This is the underlying theme of an Indian parliamentary committee report that was published January 4. It pins lot of the blame for the present mess on the government. Out of India's total installed power capacity of about 345 GW, CCGTs account for about 25 GW. But although that is just 7.2 %, their share in terms of generation is even lower, at 3.8 %. More than 14 GW of gas-based capacity is stranded as there is no domestic gas available and LNG is unaffordable. According to the report, the CCGTs have been seeing less and less domestic gas since 2011-2012 and these plants run at very low plant load factor (PLF) of about 24%. The normative gas requirement to operate the existing gas-based power plants at 85% PLF is about 102mn m3/d. However, the total domestic gas allocated to power projects is 87.12mn m3/d and average domestic gas supplied during the year 2017-18 was only 25.71mn m3/d. Further, as LNG was too expensive. The cost of generation using regasified LNG (RLNG) is substantially higher than that of domestic gas. Investments ranging from rupees 40mn-50mn/MW have been made into these stranded gas-based projects, of which about 70% - 80% of the capital cost has been financed by banks using public money, according to the report. Further there has been an additional cost escalation ranging from 50%-75% of the original project cost on account of delays primarily owing to the non-availability of gas. “These plants are now unable to service their debt obligations to their lenders and are on the verge of becoming NPAs [non-performing assets] and need the attention of government of India for their revival. Failure to hand-hold these stranded gas-based projects would see these plants going to National Company Law Tribunal. Even under Bankruptcy 10 proceedings, these plants are unlikely to find buyers till the status of gas availability improves,” the report said. Many of these stranded gas-based power plants were built in the expectation of a sharp increase in the amount of gas produced at home, particularly from KG-D6 field offshore India’s east coast. But the projections regarding availability of domestic gas have turned out to be terribly wrong as the production from KG D6 field has reduced drastically to zero supply for power sector since March 2013. “The committee feels that since these gas-based power plants were set up on the basis of the government’s assurance regarding supply of gas, it becomes incumbent upon the government to help them come out of stress,” the report said. Production from KG D6 has been consistently falling. In 2010-11 output was 55.35mn m3/d which dropped to just 5.5mn m3/d in 2017-2018 and is practically nil as present, according to India’s oil ministry. 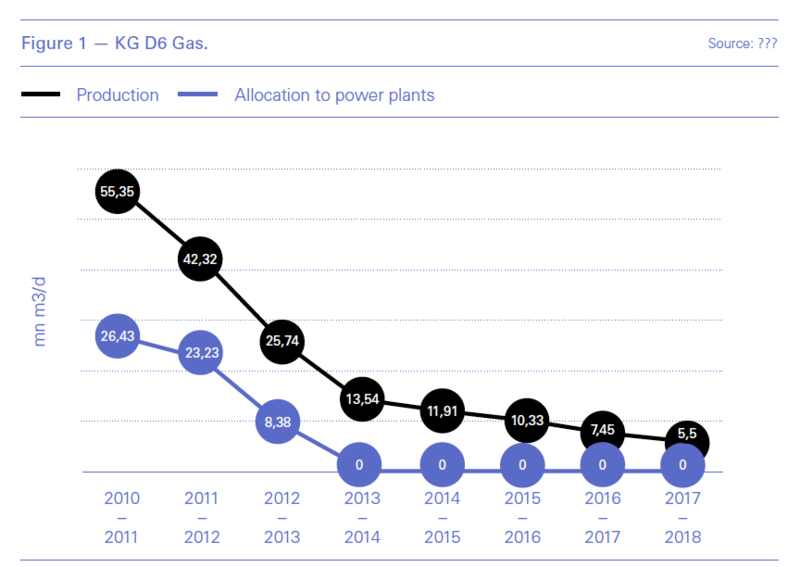 The government had expected the peak flow of the gas in KG D6 field to be about 80mn m3/d by the end of 2009, and to increase further in subsequent years. This mistaken belief underpinned a number of CCGT projects. KG D6 field is operated by Reliance Industries in partnership with BP and Niko Resources. At the time of its discovery, the field was hailed as India’s biggest gas discovery. According to the report, the committee has asked the Indian oil ministry to come out with the reasons for zero production of gas from KG D6 field. The report is also critical of government’s decision to put city gas distribution (CGD) sector above gas-based power plants in order of priority for allocation of domestic natural gas. “The committee also notes that as per guidelines issued by the government in 2010, gas-based power plants were put above the city gas distribution (CGD) systems for domestic and transport requirements in order of priority for allocation of domestic natural gas. However, as per guidelines issued in the years 2013 and 2014, gas allocation/supply to the CGD systems was placed under the ‘no cut’ category, consequently giving CGD higher priority than power sector,” the report said, adding these policy flip-flops had stranded the CCGTs. Although the committee thinks the government should rescue the CCGTs, India’s biggest state-owned lender – the State Bank of India (SBI) – is of the view that there is no way out and the investments will need to be written off. “For gas-based power plants, honestly, if I have to submit, there seems to be no solution. It is because even when the gas was at around $2.50/mn Btu, even then these plants had viability issues. When these plants were set up, the underlying assumption was that domestic gas from the Kaveri Basin will be available at a cheap price. Based on that, all these investment decisions were taken,” SBI chairman Rajnish Kumar told the parliamentary panel, as quoted by the report. “Even last time when we were trying to find out a solution, a scheme came out in 2015 from the power ministry where they gave some subsidies from the Power Sector Development Fund (PSDF). There was a period when the gas plants did not avail that benefit. It was because at that time crude prices went almost below $30/barrel and imported LNG became viable. Even with a lot of concessions from central as well as state governments, the plants could operate at around 30% PLF. So, in the current scenario when the gas price is so high and there are constraints in the supply of domestic gas, it seems as if we are groping in the dark. There is no other solution. We have to write off this investment," Kumar said. Although the lenders seem to have given up on these power plants, the parliamentary committee has recommended that the Indian government should explore all possibilities to revive these stranded assets. Some of the suggestions that the committee has offered include assured gas allocation to these power plants from state-owned explore ONGC’s deep-water fields; the diversion of domestic gas from non-core sectors to the power sector; and capping prices of RLNG until enough domestic gas is made available. It will be interesting to see how the government acts upon these suggestions given that it has been working aggressively to promote the CGD sector and has recently concluded a very successful ninth CGD licencing round. Expanding the use of gas in the residential, industrial and transport sector has been a major focus area of this government. On the issue of administered gas prices, the industry is already critical of this and has said that one of the biggest reasons for India’s stagnant domestic production is that the prices do not justify the efforts. The committee has suggested that RLNG may be pooled with the domestic gas through an aggregator such as Gail, to achieve a reasonable price. It has also said that the revenue collected under National Clean Energy Fund (NCEF), which was created out of cess on coal to provide financial support to clean energy initiatives, must be used for its intended purpose. Which, according to the report, is not happening at present. “Diversion of this fund to unrelated activities reflects poorly on our commitment towards cleaner environment and shows government's apathy towards clean energy projects. The committee, therefore, recommends that financial support should be extended to gas-based power projects from NCEF for their sustainability as natural gas is also a clean energy source,” the report said.